If you’re looking for magnificent camping opportunities near the middle portion of this great country, Illinois is definitely the place to be. Whether you’re interested in a rustic and rugged experience among the state’s tall trees, or more of a “glamping” adventure on the shores of Lake Michigan, Illinois is the perfect spot for your upcoming outdoor vacation. Illinois is a state in the Midwestern portion of the United States—a state first established in the year 1818. As of the writing of this article, the state is the 5th most populous in the union, yet only ranks 25th in terms of total land space, making it one of the most densely-populated states in the U.S.
With the large city of Chicago in the northwestern part of the state; small industrial cities and fertile farms in central and northern Illinois; and natural resources such as petroleum, coal and timber to the south, Illinois has a diverse and very productive economy and is also considered one of the transportation hubs of the United States. Although Illinois lies entirely within America’s Interior Plains, the state does have some variation in its elevation, which makes it a great place in which to camp and explore. Charles Mound, located in the extreme northwestern part of the state, boasts Illinois’ highest point of elevation above sea level, standing some 1,235 feet. Other great places to pitch a tent include the Shawnee Hills in the south, and the dozens of campgrounds along the state’s many rivers, lakes and streams. In the following article we will focus on five of the most popular places to camp in Illinois, including an in-depth description detailing each of these campground’s many amenities, characteristics and the activities they provide for the guests that camp there. Considered one of the finest state parks in Illinois and the Midwest, Starved Rock State Park offers a wealth of fun outdoor activities, optimal facilities and amenities and breathtaking scenery you have to witness to fully appreciate. Whether you enjoy hiking on the many trails at Starved Rock State Park or simply sitting back and viewing the spectacular overlooks along the mighty Illinois River, the recreational opportunities at this gem of a park are abundant. Guests who opt to pitch their tents in this wonderful park can enjoy activities such as fishing, picnicking, boating, rafting and horseback riding, as well as skiing, snowshoeing and a number of other winter sports during the colder months. There is so much to do in this spectacular park and campground that it’s essentially impossible to be bored. The dozens of campgrounds at Starved Rock State Park feature a number of great amenities, including picnic tables, BBQ grills, fire rings, restrooms with showers and electrical and water hookups for Recreational Vehicles and trailers. Once you set up camp you can enjoy the magnificent backdrop of 18 distant canyons, each formed over the years by glacial melt water and stream erosion. These canyons slice dramatically through tree-covered, sandstone bluffs for roughly four miles at Starved Rock State Park, which is conveniently located along the south side of the Illinois River, just one mile south of Utica, Illinois and midway between the cities of LaSalle-Peru and Ottawa. Starved Rock State Park is best known for its fascinating rock formations, primarily St. Peter sandstone, laid down in a massive shallow inland sea more than 425 million years ago and later brought to the surface. The fee to camp at one of Starved Rock’s 129 Class-A Premium campsites is $25 per night, and reservations are recommended. The maximum stay is five consecutive nights in any of the park’s campsites. The park has a camp store that operates seasonally from May through October, where campers can purchase items like firewood, ice, soda and supplies. Alcohol is not permitted in the Starved Rock State Park Campground or anywhere else within the park. 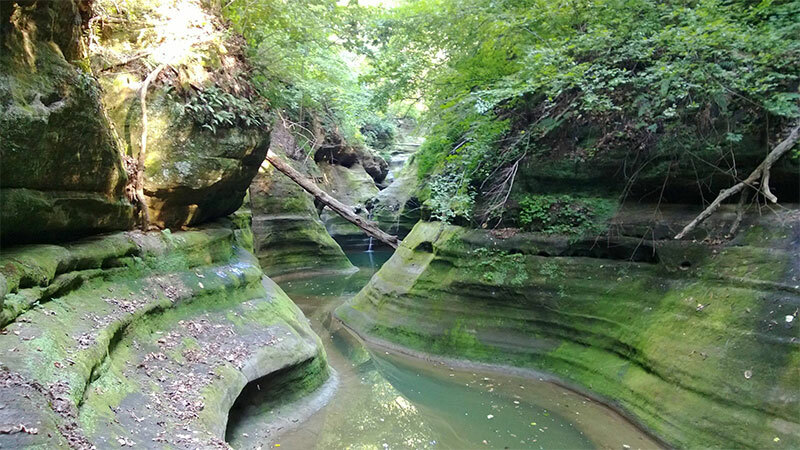 With its awe-inspiring natural beauty and the unlimited number of opportunities for outdoor recreation, an excursion to Giant City State Park, located near Carbondale, Illinois, is sure to excite and please visitors and campers of all ages. From camping and horseback riding to fishing and rappelling, Giant City State Park is a genuine paradise for outdoor enthusiasts. Guests of the park will marvel at the collection of various-rated hiking trails, all of which can be reached easily from the campground. Particularly of interest is the Giant City Nature Trail, which plays host to the “Giant City Streets,” huge bluffs of sandstone formed roughly 12,000 years ago. Nestled deep in the Shawnee National Forest, Giant City State Park was named for the unique impressions made by its enormous sandstone structures and a landscape like none other, with lush garments of fern, moss, flowering mints, hundreds of species of wildflowers and more than 75 varieties of flowering trees. Campers are free to venture into the Giant City Visitor Center, which provides interpretive displays on the geology, plants, wildlife and history of the park, and regional tourism information. Also special is the Giant City Lodge, the ideal fit for the natural splendor of the park, with three types of cabins, and the Bald Knob dining room. The lodge also features a gift shop, lounge and outdoor swimming pool. The varied and well-kept camping facilities at Giant City State Park provide water, electricity, showers and sanitary facilities for both tent and RV camping. There is also an equestrian center where guests can go horseback riding and where younger campers can receive camping lessons for a small fee. Illinois Beach State Park offers the best of both wilderness and water front camping, complete with all the fun activities campers have come to enjoy. Stretching six and a half miles along the sandy shores of Lake Michigan in Northern Illinois, the park offers a vast collection of recreational opportunities at one of the most unique and beautiful natural settings on the planet. Illinois Beach State Park is a 4,160 acre park, considering of two distinct areas or regions—the North Unit and the South Unit. The park offers a full range of activities, including swimming, boating, picnicking, hiking, fishing, camping and simply appreciating nature. In addition to swimming beaches, trails and campgrounds, the Illinois Beach Resort and Conference Center is the ideal place to get away for a weekend or week-long vacation. Camping is only permitted in the South Unit of the Illinois Beach State Park, in a campground that provides 241 Class-A Premium sites equipped with water and electricity, with easy access to showers and sanitary facilities. Guests must obtain a camping permit from the park staff prior to setting up camp. The campsites can be reserved through the Illinois recreation website, but they are also available on a first-come, first-served basis. Fishing is permitted along the beach area of the park in both the North and South Units, except in those areas marked for swimming. There are also several small inland fishing ponds, including Sand Pond, where a disabled fishing pier is available. Illinois Beach State Park also provides great hiking opportunities. The southern part of the park features 5 miles of trails, including a 2.2 mile loop trail with a graveled surface to the north for easy footing. Camp Logan Trail, which is very popular among campers and day visitors, is a 1.8 mile multi-use loop trail that cross country skiers can also use when visiting Illinois Beach State Park during the winter months. Located along the west bank of the Rock River in Ogle County, Illinois, Castle Rock State Park is an outdoor oasis that is fun for young and old and everyone in between. The park, which is situated just three miles south of the Oregon border on Illinois Route 2, is centrally positioned in the Rock River Hills region of the state, and its rolling, varied landscapes are drained by one of the central features of the park—the Rock River. Castle Rock State Park is representative of the Rock River Hills Area, featuring rock formations, deep, rocky ravines, and unique species of local plant life. A sandstone bluff, adjacent to the river, resembles a large castle and is the namesake of this magnificent recreation area. Castle Rock State Park boasts a primitive camping area that is accessible only by boat, canoe or other watercraft. Once there, campers can participate in any number of fun activities. Three picnic areas are available for use at the park, with shelters, large picnic tables, BBQ grills, toilets, drinking water and a playground for the kids. There are, additionally, six miles of well-marked hiking trails, where the adventurous can view woodland animals and the many species of birds that are frequently the target of photographers. Along the Rock River, Castle Rock State Park offers one and a half miles of bank fishing. A boat ramp is available along the bank, although the size of the boats allowed in the river varies from season to season due to the change in water depth. The most commonly hooked fish here is the Channel Catfish, but other species, such as bass, Northern walleye, and crappie have also been taken by patient, experienced anglers. All of the campsites at Castle Rock State Park are available on a first-come, first-served basis, and those sites very near the beautiful Rock River tend to fill up rather quickly. The Lake Shabbona State Park campground is a wonderful place in which to spend a weekend or more while enjoying all the amenities and activities this scenic state park has to offer. Lake Shabbona State Park campground is a semi-wooded and very beautiful area, with 150 Class-A Premium campsites that are always well cared for by the park staff. The campground boasts water and electrical hookups; restrooms and showers; several picnic areas with tables, grills and an overhead shelter; superior vehicle access; a boat launch ramp; a playground for the children; a kid’s fishing area; and a well-stocked camp store where guests can pick up everything they need for their camping adventure, including ice, firewood, cold drinks, bait and tackle, and a variety of handy camping supplies. Each campsite at Lake Shabbona State Park features a gravel parking space, plenty of wooden seats, and a campfire ring for nighttime get-togethers. Campfires are only permitted within the fire ring. Lake Shabbona State Park also has two cabins available for rent. The cabins consist of two large rooms that total approximately 200 square feet in area and are situated near the shore of the lake facing the southeast overlooking the water. The area is shady and rather secluded. Cabins must be rented at least two days in advance. Vehicular access to Lake Shabbona State Park campground is prohibited between 10:00 PM and 6:00 AM. All boats must be off the water by 9:30 PM or they will face a fine issued by the Park Service—one that accrues with every minute the boat is late. From May 1st through October 31st, guests may check into Lake Shabbona State Park from 6:00 AM to 10:00 PM to receive their camping permit. All tent sites are available on a first-come, first-served basis, and the lake-facing sites tend to be the most popular. Guests desiring a lake-facing campsite are urged to arrive early to secure their spot.